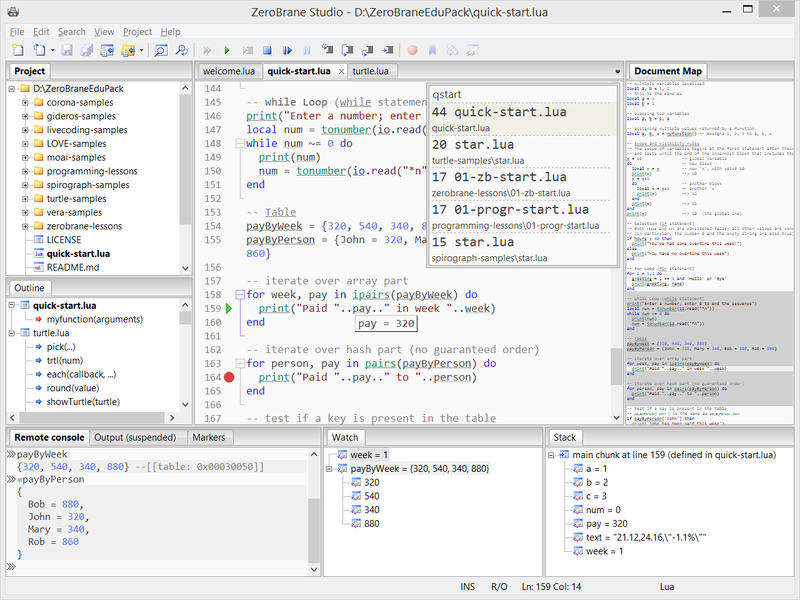 ZeroBrane Studio is a lightweight Lua IDE with code completion, syntax highlighting, live coding, code analyzer, and debugging support for Lua 5.1, Lua 5.2, Lua 5.3, LuaJIT, and other Lua engines. It is simple and instantly usable for beginners (as tested with middle and high school students with no programming experience), yet feature-rich and extensible for experienced developers. 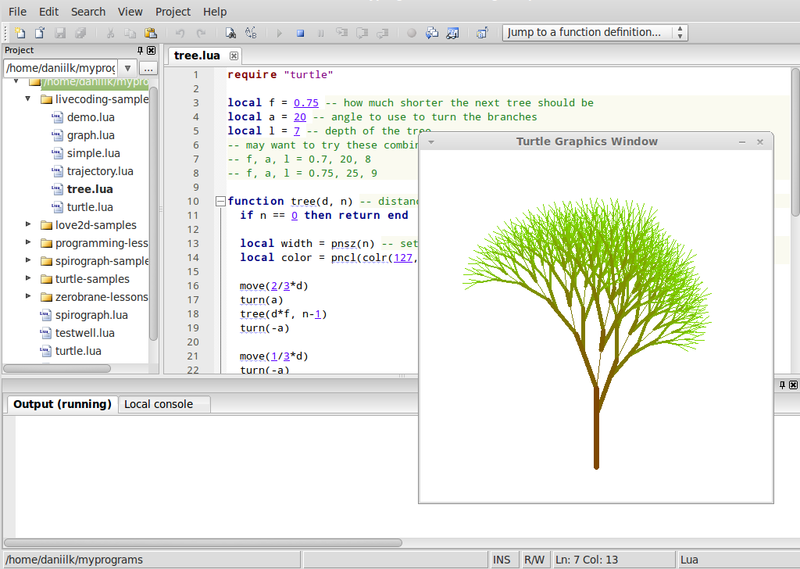 Unlike Eclipse and IntelliJ, it has a small footprint and is completely customizable with Lua. 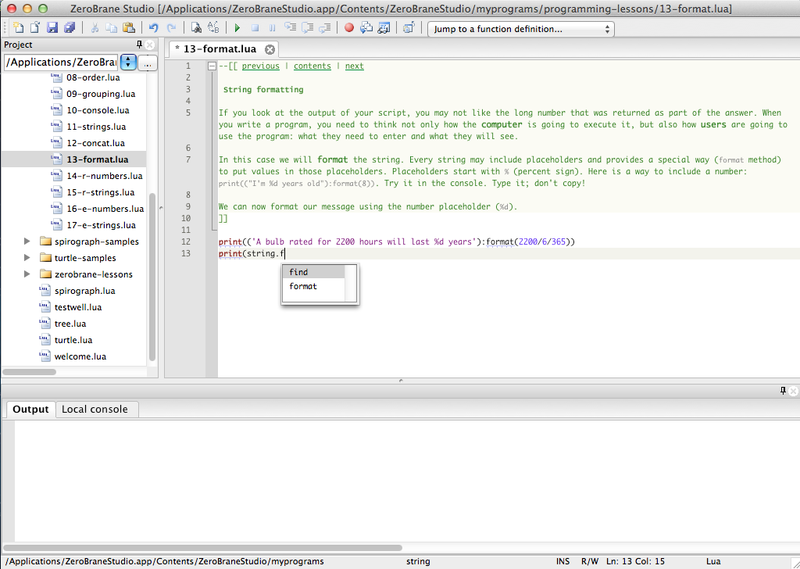 Unlike TextMate and Sublime Text, it includes a remote debugger and a full IDE feature set. Unlike Decoda, it runs on Windows, Mac OSX, and Linux and supports on-device debugging. ZeroBrane Studio also provides several unique features: live coding for immediate feedback, Markdown formatting in comments for providing instructions with minimal context switching, and integrated interactive materials for those learning Lua or getting familiar with programming. For those interested in game and mobile development, the IDE supports debugging for LÖVE, Moai, Gideros, Marmalade Quick, Corona, and Cocos2d-x. It also supports general Lua debugging for Wireshark, GSL-shell, Adobe Lightroom, OpenResty, Lapis, Moonscript, home automation, and more. Integrated debugger (with support for local and remote debugging), and more. This discussion is only about Zerobrane Studio (Portable) and the Zerobrane Studio (Portable) package. If you have feedback for Chocolatey, please contact the google group. Tell us what you love about the package or Zerobrane Studio (Portable), or tell us what needs improvement. Deployed from e27d7a207f. You are on web.2. UTC time is currently 25 Apr 2019 20:54:43 +00:00.